This is perhaps the most peculiar release to reflect upon when looking at the career of Elton John. Although one could argue that this album lacks direction or focus, it's pretty obvious that none was really intended. Rather than a collected effort to do something lasting and meaningful, this one tends to be nothing more than an exercise in pleasure to work with many different artists from various backgrounds. We must remember this when reflecting the quality of the music. Sixteen songs, with fifteen different artists also mean a huge conglomeration of musicians, artists, producers, styles and settings so we shouldn't really expect anything too coherent. Right? Some songs work, most of them don't. There's only two original John/Taupin compositions and it's no surprise that they're among the best. The Power with Little Richard is a great up tempo Gospel type piece that is hard to sit still through. Whereas A Woman's Needs with the late Tammy Wynette is one of the most beautiful (and, sadly, overlooked) piece from the John/Taupin collection. On the other side of the coin, there are some real dogs on this work as well. Some songs are done in such a completely different style that you'd expect from the particular partner, it's hard to take seriously or enjoy. We really don't need a dance/disco tune with K.D. Lang or a funky/blues tune with Don Henley. Something more similar to what those two great artists are known for would make such selections better. 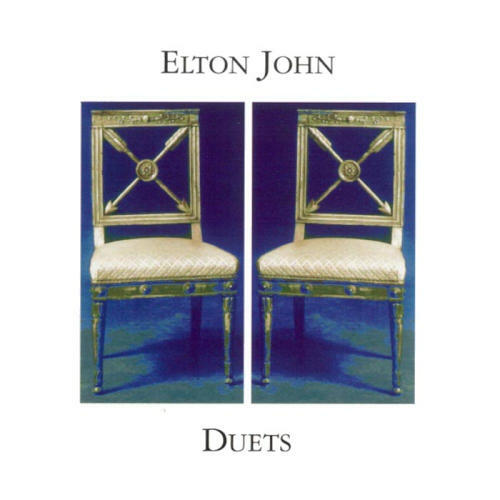 Then, we have the disastrous remake of Don't Go Breaking My Heart with Ru Paul, which is probably the worst thing Elton has ever done. It would have been better to include the original with Kiki Dee, although she does make an appearance with Elton on Cole Porter's True Love which is one of the nicer pieces. If You Were Me with Chris Rea is also well done, and, depending on your tastes, the now famous Don't Let The Sun Go Down On Me with George Michael is included. The rest is only so-so. But, heck, if you have as much money as Elton, why not do something like this for fun if you want? He certainly deserved to do whatever he felt like at this stage of his career. He probably had fun as well. Just don't expect a masterpiece.